The topic of sensitive bladders and bladder leakage is a topic not everyone will want to read but if you are one of the many who suffer from this problem, you just might be interested. The most common reason for bladder leakage has to do with pregnancy but it affects many women for other reasons as well. I’ve had the problem basically all my life and I don’t really know 100% why. It may have to do with a bus accident I was involved in when I was 5 that involved trauma to my mid-to-low abdomen. Perhaps the trauma itself is to blame or perhaps 5 weeks of being in a hospital bed afterwards made my uterine muscles weak as well as all the rest. No matter the cause, I have it and will probably always have it and I just need to deal with it the best way I can. I started off using feminine pads but quickly discovered that there were special liners specifically designed for incontinence that worked much better. Until recently I was using a well known liner but I have recently switched to Always Discreet because it works better and costs less. 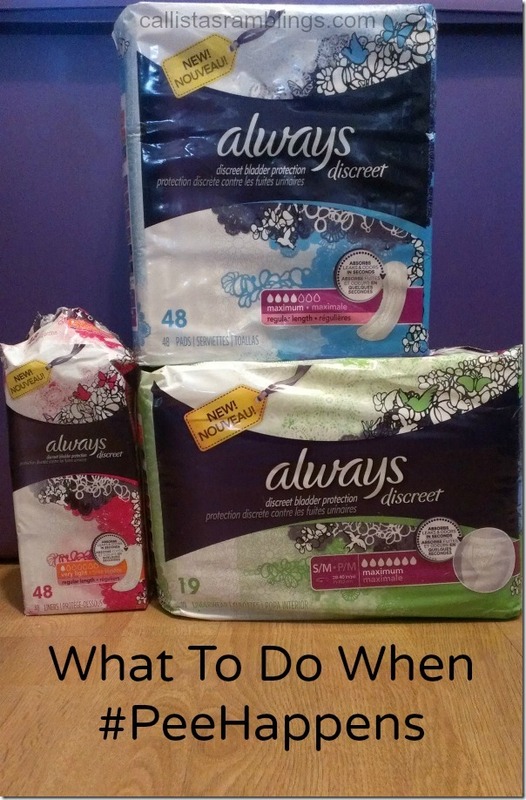 I was offered the chance to try out the new Always product as a P&G Mom and I’m glad I did. I already purchase Always for my feminine pad needs and now I can turn to them for my bladder leakage liners as well. I have light bladder leakage so I use the liners but they also have pads and underwear depending on your needs. Having only used liners I can only speak about them but the Always ones are thinner than my old brand and they stay in place better. They are also cheaper which is always a bonus! Check out the infographic below for more facts to see that you are not alone! Also check out the Always Discreet website for an anonymous forum and helpful advice from a doctor.